Less 50% off the regular price of P888 for groups of 6 or more! Mark your calendars, it's a one day affair only! Half price buffet on DAD's 38th anniversary. A special 50% discount awaits you on Wednesday, August 26, 2015 in all DADS branches. The catch? You must at least be a gorup of 6 and the half price treat should be strictly PRE-booked and PRE-paid. 1. A Confirmed Reservation is required. 2. A group of 6 or more persons is required. 3. To confirm your reservation, full payment must be made one week after the reservation has been made with the desired branch. Payment can be made directly to the Branch or thru Bank Deposit. 4. No additions to previously reserved guests will be honored. 5. Please present confirmation letter or show the confirmation on your smart devices upon arrival. 7. Let us give way for the next reservation. Guests must finish lunch or dinner and vacate the table within the reserved seating time to avail of the 50% discount. 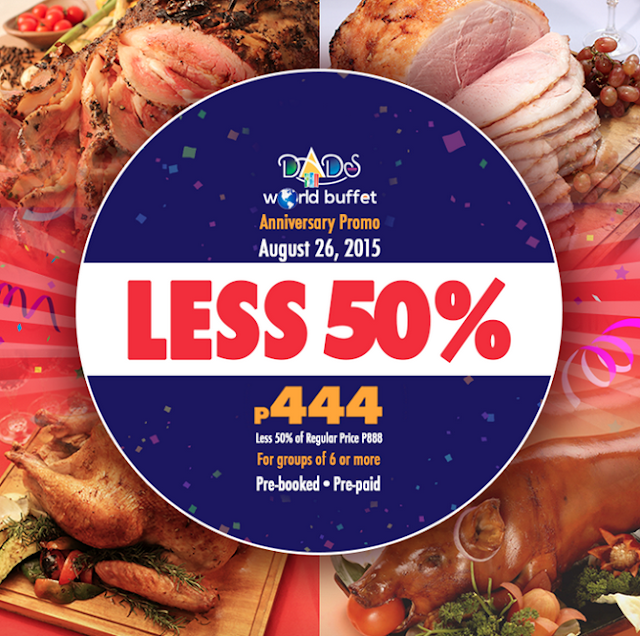 Should you exceed the reserved time, you will be billed the full amount of Dads World Buffet Price at P888. Your cooperation in following these guidelines will enable us to accommodate all your reservations and give you a truly different, utterly delightful visit at Dads. We look forward to the pleasure of serving you the food products, unique menus and cooking styles of the world’s most popular cuisines. The world’s best awaits you at DADS WORLD BUFFET. Happy Anniversary DADS!